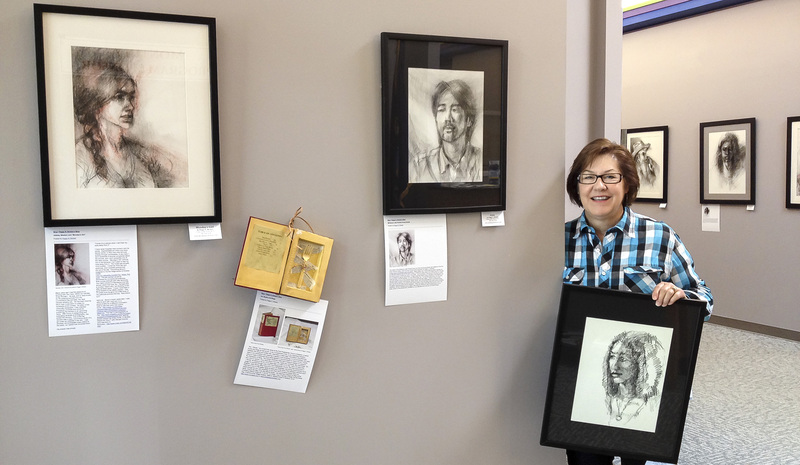 Peggy Brewer hangs some of her pieces in the Howell Area Chamber of Commerce Foundation Building. 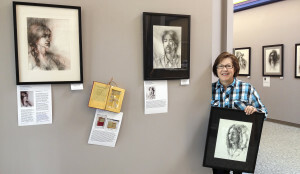 The work of artist Peggy Brewer is now on display in the Howell Area Chamber of Commerce Foundation Building at 123 E. Washington St. in downtown Howell. The show combines art with words in all media, and both 2-D and 3-D forms that include drawings, portraits, books and boxes. Brewer’s work is currently on display in other locations in Livingston County, including the Wooden Spoon, Ciao Amici’s and Art in Bloom in Brighton. Born and raised in Detroit, Brewer attended Cass Technical High School by invitation as a Science and Arts major with electives in art, and graduated from Wayne State University with honors in American Studies. Her career in communications combined writing with visuals. She is a past president of the Detroit chapter of the International Association of Business Communicators (IABC). She is also the manager of the Whitmore Lake Portrait Group, and serves on the board oft he Brighton Art Guild. She is also a member of the Ann Arbor Area Pastelists, Ann Arbor Women Arts and the Great Lakes Pastel Society. Check out her website at www.artistpeggynbrewer.com.